A late goal from Juan Mata helped Valencia take the spoils in the local derby against Levante and maintain their top-four ambitions. The winger had earlier missed a penalty and struck the crossbar with a free-kick, but he made amends by sliding home the winner in the final ten minutes to hand Unai Emery's men three consecutive Primera Division wins. The home crowd generated a lively atmosphere inside the Ciutat de Valencia, but the standard of football on the pitch could not match what was an important occasion for the hosts. Luis Garcia’s enjoyed the best of the opening spell without creating any genuine opportunities, with Felipe Caicedo as usual being the most prominent attacker. Valencia begun to grow into the contest, however, and on 26 minutes they were given a dream opportunity to open the scoring. Miquel Robuste needlessly blocked Hedwiges Maduro’s run into the area, and the referee did not hesitate in pointing to the spot. Juan Mata strode up confidently to convert, but only contrived to clip the top of the crossbar as the ball whizzed over. It was a poor effort from the usually reliable Spanish international. The match labored into the second half, a scrappy affair with neither side showing much in the way of quality. Levante threw on Christian Stuani and reverted to a 4-4-2, and within a minute of being involved the substitute crashed down in the area after a clash with Miguel, demanding a penalty that was not forthcoming. Valencia rallied. Mata, still reeling from his spot kick miss, started to become involved again, and saw a beautifully floated free kick crash back off the crossbar, with home keeper Reina getting the faintest of touches to the effort. But Los Che were upping the ante, and eventually they got the breakthrough their play deserved. Pablo Hernandez played the ball through to Mata, who was marginally played onside by full-back David Cerra, and this time the winger made no mistake, showing composure to roll the ball into the corner past the dive of Reina, and record his third goal of the season. The Granotes had no time to respond, and Emery was delighted to see his team bounce back from Copa del Rey disappointment in midweek to edge three points clear of the chasing pack in the race for the top four. Levante (0): Reina, Cerra, Robusté, Pallardó (Sergio, min, 64), Nadal (Muñoz, min. 75), Juanfran, X. Torres, Ballesteros, Juanlu, Rubén (Stuani, min. 64) y Caicedo. Valencia CF (1): Guaita, Maduro, Topal, Soldado (Vicente, min. 75), Mata (Éver, min. 92), Aduriz, Dealbert, Stankevicius, Pablo (Feghouli, min. 87), Miguel y Jordi Alba. Goals: 0-1 Min. 83 Mata. Guaita 6 - Not much to do, though seemed quite confident in his performance. Miguel 5.5 - Made few defensive mistakes, but largely good at the back and offered decent performance going forward. 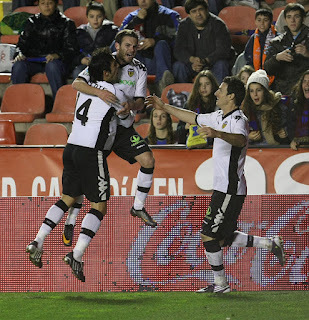 Stankevicious 5.5 - Not much that he could do as Levante barely attacked all 90 minutes. Dealbert 5.5 - Same as Stankevicious. Alba 5 - His worst match this season, good defensively, but everything he did offensively was several bad passes. Pablo 7 - Made the assist for Mata's goal and generally good in attack, served more as a creating midfielder rather than a winger. Maduro 6 - His running into the Levante penalty area allowed for a penalty and generally decent, though as usual he became less and less effective towards the end. Too little fitness perhaps? Topal 5.5 - Did well defensively, though had an easy time as Levante barely attacked. Mata 6 - Scored a goal, but on the other hand he missed a penalty and scrambled few good chances. Aduriz 5.5 - Run and fought the whole 90 minutes, but he was cut from service. Soldado 5.5 - Often came outside to get the ball and was available for passing, not much service to him either. Vicente 6.5 - When he came in the left side immediately became more dangerous. Showed Mata how to play from the wing as he made several good runs in the short time he had.